This post has been sponsored by Faultless Brands, makers of Bon Ami. All thoughts and opinions are my own. A lot of my readers are mothers who either stay at home with their kiddos or work outside of the home—with busy and chaotic lives to say the least! Between diapering, school drop off, and all of the demands in life, cleaning usually falls to the wayside because it’s not always enjoyable and it can be the last thing that feels important given all of the “Mom” demands we face daily. Here are some tips that I try to abide by when it comes to keeping my kitchen and bathroom clean, and by no means do I do this perfectly. There are many days when cleaning my house is the last thing I pay attention to, but hopefully, these ideas can help encourage you! Use Great Products That Work! First and foremost, make sure to keep an arsenal of products that are tried and true in your home. I love natural cleaning products with simple ingredients that are safe and effective. 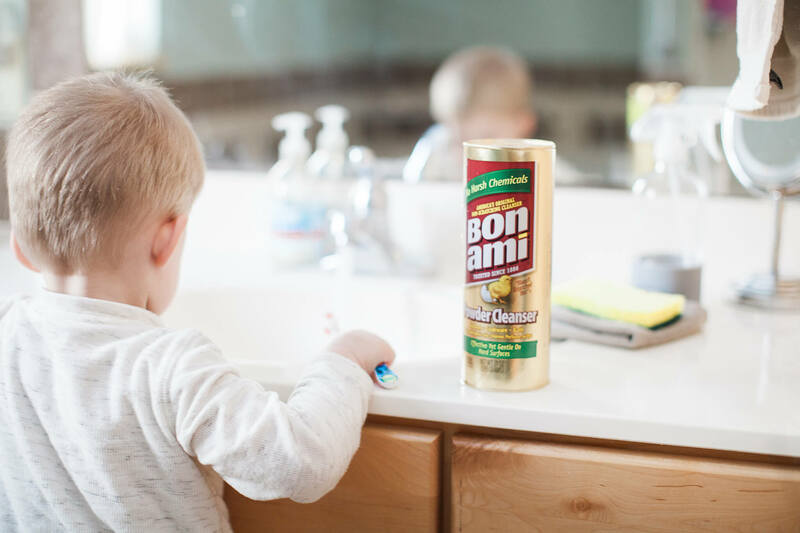 One of my new favorite cleaning products is Bon Ami Powder Cleanser. This product has no harsh chemicals and is safe to use in the kitchen around food, young kids, and pets. I also love that it has a variety of uses—pots and pans, kitchen, and bathroom. The versatility of a product is such a big deal when it comes to using great cleaning products. I know this can sound super counterintuitive, but it has worked for me with Rowan. There are days when I schedule cleaning certain spaces in our home into my calendar; otherwise, it may never get done. On bathroom cleaning day, I typically ask Rowan to join in the fun. I’ll give him a wet rag with a little bit of water on it, a broom, and sometimes he just likes to stand at the sink, run the water, and “brush his teeth.” Either way, I always feel confident and comfortable with the cleaning products I am using around him. 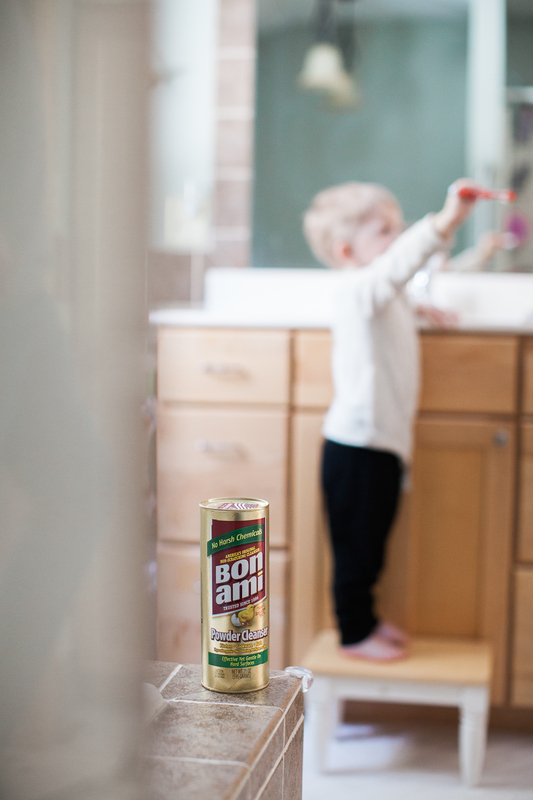 Bon Ami is great to use in the bathroom, and I don’t have to be concerned about whether or not Rowan will come into contact with the cleaning product. 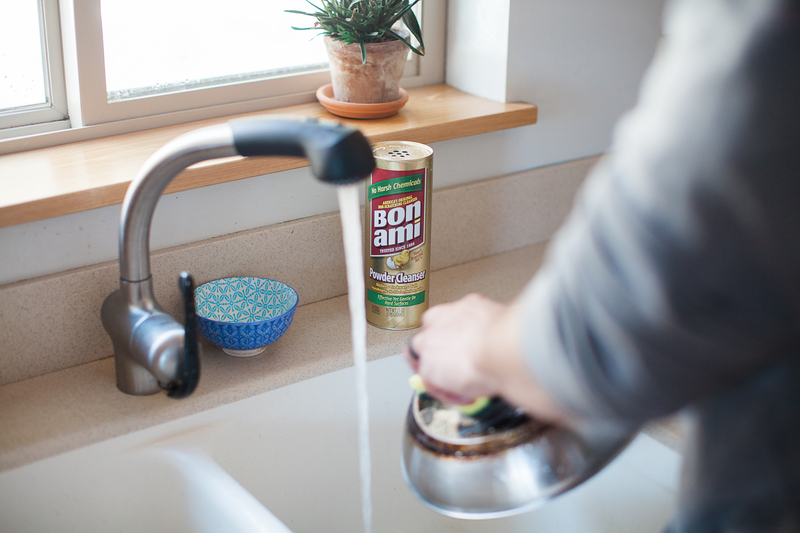 Bon Ami’s simple ingredients do not contain harsh chemicals, so this gives me a huge peace of mind! 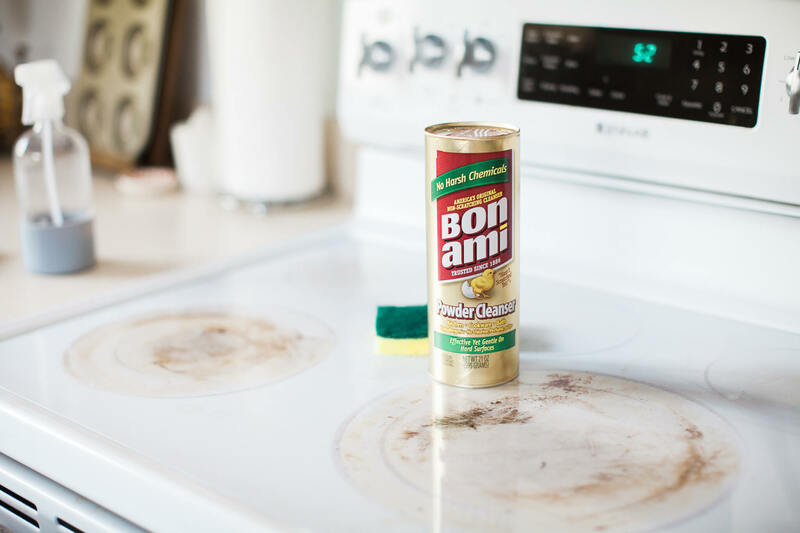 When it comes to deep cleaning our kitchen, I usually get Dusty involved. I typically schedule this for once a week, usually in the evenings after Rowan goes to bed or else directly after dinner while Rowan is playing. I like to do this weekly because if I don’t, it really just creates a ripple effect and before you know it my kitchen looks so terrible! We usually will clear everything off of the counters and start by scouring the stove top, which is almost always brown with stains and grease. I will spritz the stovetop with water, sprinkle it over with Bon Ami, let it sit for a minute and then use a sponge to scrub it clean. Once our stove top is sparkling, we tackle the kitchen sink! 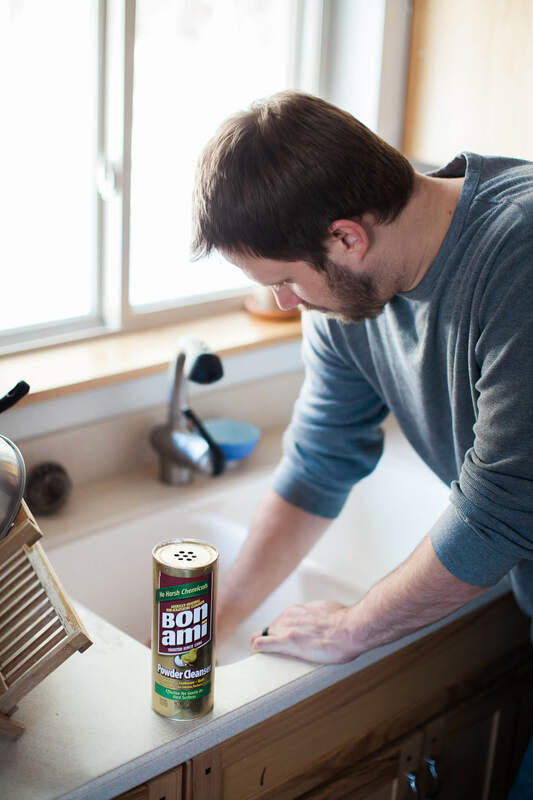 Dusty cleans up any pots and pans that are left over from dinner and then we scrub out the sink, again, using Bon Ami to help us along the way. 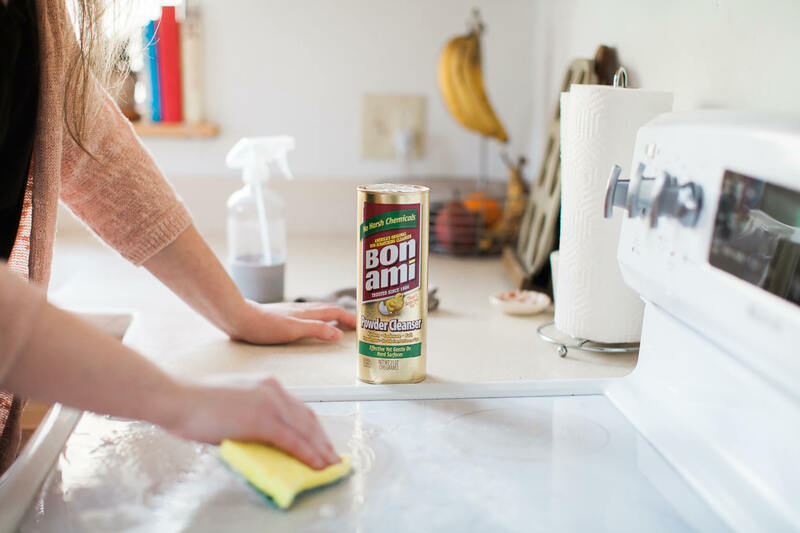 What I love most is that Bon Ami can be used across all sorts of rooms and surfaces in our home, safely and effectively. Keeping things simple, easy, and safe!